The Free and Democratic Society of East Kurdistan (KODAR) Co-chair Fuad Beritan spoke to ANF English service regarding the latest developments in Kurdistan territory. Q: As we know, KODAR held its second congress in Medya Defense Zones late October. What are the major changes made with this congress? In fact, the answer can be from two perspectives, first the paradigm that KODAR was established on has clearly proven in Rojava (West Kurdistan) and it has credits that can be relied on for answering many political and social questions that people have for the way of life to be democratic and just. Next to this, the political situation in Iran as well as in the region has been undergoing changes, every single one of these changes has been impressive on the political equation in Iran and East Kurdistan. In the second congress all these topics, including the opportunities and dangers were seriously discussed. In its entirety it can be said that in line with its goals, and based on experiences made in the past two years, KODAR took a step forward and prepared a new chapter for the realization of their democratic campaign and comprehensive model of democratic confederacies. Q: Is there any changes towards the Government of Iran from KODAR’s perspective or is your previous position still to be considered ? Fundamental principle of KODAR towards the government of Iran is this; if the government recognizes democratic rights and if it is willing to change the constitution, KODAR will work with them to make society democratic and free otherwise we will attempt to make it by our own. So this how the KODAR treats the issue. KODAR is a democratic system that will not accept the Nation Regime. KODAR is a community based on organisation and will for the expansion of democracy. 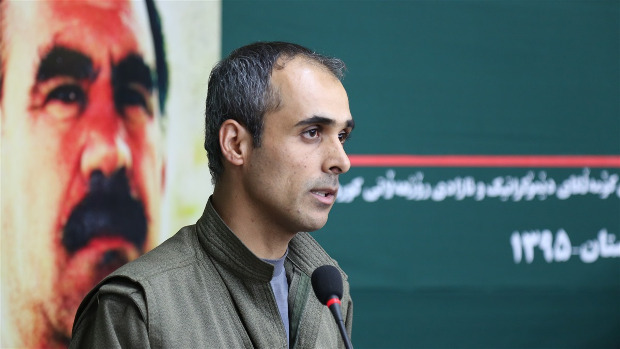 We prefer solving the Kurdish issue in democratic way, but if the Iranian regime chooses the other way, then the situation will result in another condition in which KODAR are well prepared for resistance and defense. Q: You have declared during the congress that if the Iranian regime changes its approach towards the issue of people’s rights, you can make dialogue with them, although they are not accepting any opposition groups. Do you believe the regime will chose a democratic way to solve the Kurdish issue and internal problems? Recognition of the rights of people and democratization of Iran will increase the power of Iran in the region and around the globe, while the contrary will render Iran weak. Kurds are gaining more and more power and attention around the globe and in designing the new Middle East every day, so aligning with Kurds would be much beneficial to the regional government and they should not be eliminated. Being enemy of Kurds is not in the interest of anybody and will open the door for more problems in the region. Q: Well, another point is about KODAR being an umbrella for Kurdish parties and politicians. Do you think these will join KODAR in the way that you are trying to make, and have an alliance of Kurdish movements under the KODAR agenda? Creating an inclusive democratic front in East Kurdistan (Rojhelat) and Iran is a historical necessity. Divergence of those political parties and forces is a serious threat to democratization in Iran. All of democratic forces and voices should come together to make the changes faster. In addition to the Eastern Kurdistan parties, we consider further interaction and convergence with the republican and democratic parties of Iranian Azeri, Arab, Turkmen and Baloch circles, and transformation with other progressive forces as well. A historical and strategic goal is a necessity in this regards. Q: Talking about Federation, there has been some progress toward that in West Kurdistan. At the same time the Syrian Democratic Forces are in battle to liberate Raqqa. What is the similarity between you as KODAR and that region in North Syria or West Kurdistan? The model in West Kurdistan is practically the realization of what we want for Rojhelat; i.e. self determination and self-governance with all political varieties, and recognition of religious minorities and ethnicities in the dominated areas. Besides this, there is also a realization of equality between women and men at all levels of social, political, military and administrative fields. West Kurdistan is currently implementing the most progressive social contract in the Middle East and there are practical mechanisms and monitoring systems being created. The democratic paradigm in West Kurdistan does at the same time have huge capability of protecting itself, which was manifested in the epic of Kobanê. Kurds are a major regional actor and there will be no practical project in the Middle East without a consideration of their will and democratic and human demands. Resistance and refusal to resolve the issue of the Iranian regime only increases the cost and time to make a little procrastination. Q: Recently, people of East Kurdistan tried to hold a rally in support of the Peoples’ Democratic Party (HDP) in some cities like Kirmaşan and Tehran. Supporters took to the streets and expressed their concerns. However, the Iranian Regime militarized the people in many cities. How do you evaluate this approach of the Iranian regime? This should be answered by Iranian Regime, why demonstration against Turkish fascist government should be deemed to be a threat to the Iranian Regime? Creating a barrier to civilian protests is unacceptable to the Kurdish people. Politically the Turkish regime and Iranian regime are virtually two opposing sides and are neutralizing each other, as is seen in their approach towards the Syria and Iraq issues. Iranian regime should not think that Kurds are a threat to the national unity, as any action to support Turkish regime is not helping the Iranian issues with Kurds to be solved but rather make it more difficult. If Iranian regime is indeed not ally of the Turkish regime, why are they preventing the peaceful demonstration? Q: As the last question, the Iranian parliament has recently discussed the formation of an Azeri fraction, what would be KODAR’s approach be regarding the creation of such a fraction and to what extent can this fraction be useful? In our opinion, constitution of a fraction of Azeris, Kurds or Arabs can be considered useful in the event that it aims to play a democratic role. Otherwise, only making a name is not enough and will not seek achievement. The basic issue is to what extent this fraction will be able to make a move in direction of achieving fundamental and human rights in Iran and terminating the violations of those rights.